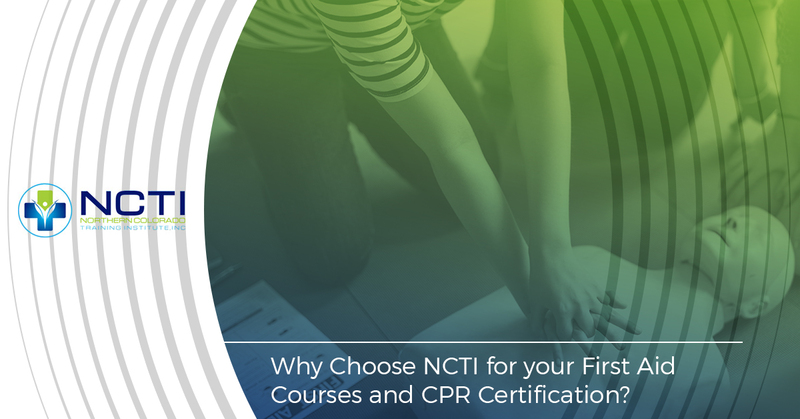 Why Choose NCTI for your First Aid Courses and CPR Certification? You’ve decided to advance your career and get some more certifications. Excellent choice! The medical field is always looking for new people, and the more training you have, the more in-demand you’ll be. If you take first aid courses and CPR training, you’ll have an excellent start in your medical career. Now that you’ve decided what type of classes you need, it’s time to decide where you’ll be receiving this training. If you haven’t already decided on Northern Colorado Training Institute as your training center, allow us to give you a few reasons you should choose us. We know that the training you receive is only as good as the person teaching the course. That’s why we only hire the best, those certified and experienced with the particular training at hand. We teach the most widely-accepted techniques so that you can slip right into your new position without problems. We are an approved American Heart Association (AHA) training site, as well as approved by the American Safety & Health Institute (ASHI). Our facility is state-of-the-art, as is all of our equipment. That means you’ll have the knowledge necessary to work in today’s high-tech hospitals. When it comes to medical training in Northern Colorado, it’s not like there’s a medical training institute on every corner; choices are limited. We also know that not everyone wants to head into Denver every day, fight the traffic, and pay for parking. We find that Northglenn offers the perfect location to accommodate as many people seeking BLS certification, CNA programs, and CPR classes as possible. It’s an excellent centralized option for the northern Denver suburbs and can also draw people down from Loveland, Longmont, and Fort Collins. NCTI is constantly running classes, so you never have to wait long for the one you’re looking for to be offered. Need a 12-Lead ECG/STEMI recognition course? Interested in BLS certification? All you have to do is contact us to find out when the next course is starting. We’re not just first aid courses and CPR. We offer a wide variety of courses that may be necessary before you further your training in your chosen field. For AHA we offer basic life support classes, Heartsaver CPR/AED, and Heartsaver First Aid/CPR/AED classes. ASHI classes include Advanced Bleeding Control, Advanced Cardiac Life Support, and Bloodborne Pathogens. We also offer CNA courses and Introduction to Capnography, as well as the 2-Lead ECG/STEMI recognition we mentioned earlier. When you’re looking for medical training, you don’t have to bounce around to multiple centers in order to get the training you need. Just choose NCTI! You’ll be trained by top-notch staff who have extensive experience in real-world situation and as teachers. The training you’ll receive is an excellent step toward advancing your career. We look forward to seeing you in class!